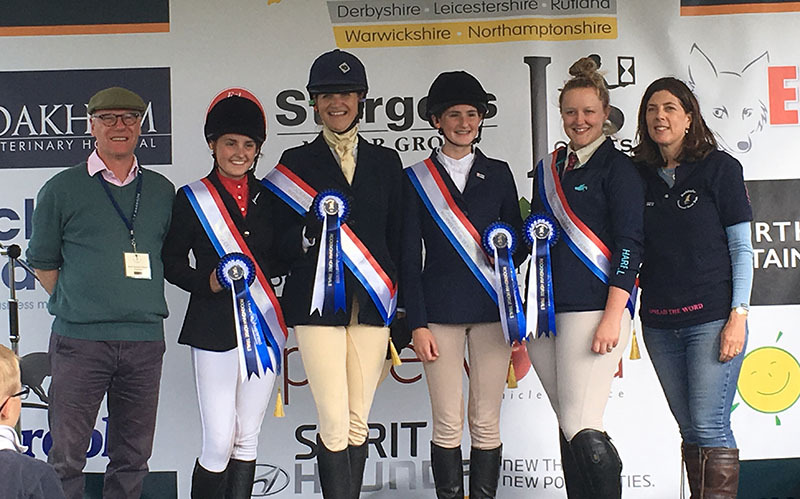 On Sunday the sunshine finally came out to play, to the delight of the Riding Club competitors – they were making their debut at Rockingham International this year, following on from the success of the Pony Club Team Showjumping from previous years. As with those Pony Club riders there was some high quality jumping from all the riders across the three height sections. However it was the Rearsby Rangers who stole the show. Rearsby had two teams jumping at this year’s competition, the Rearsby Rangers and the Rearsby Rovers but it was the Rangers who took victory in both the 80cm and 90cm classes. Rangers rider Tracey Walker took her team to glory with an fluent and confident performance in the 90cm, taking first prize. The holding ground, an aftermath of the downpours earlier in the event, didn’t phase Tracey – and there were no complaints about the sticky ground and a difficult course from this competitor. One of the riders shouted: “We will see you in May next year but on this side (pointing to the main arena).” Time will tell.